Carver has a beautiful line up of boats and this Carver C52 does not disappoint! 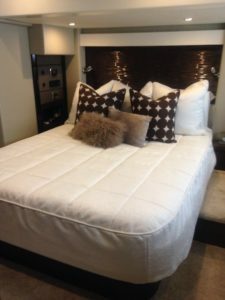 Beautifully appointed throughout and very spacious staterooms make this cruiser a great choice. Our wonderful client in Texas sent us pictures of her finished staterooms and we love the polished, understated look of this great combo of colors and textures. Neutral tones with heavy textured custom boat pillows always provides a great aesthetic that keeps the look modern and interesting. 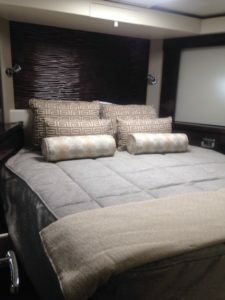 Contact us at info@yachtbedding.com with the year, make and model of your boat and we are happy to help put together the perfect look for your boat.